On the following screen you will see a list of statements to rate based on how similar they are to your life. 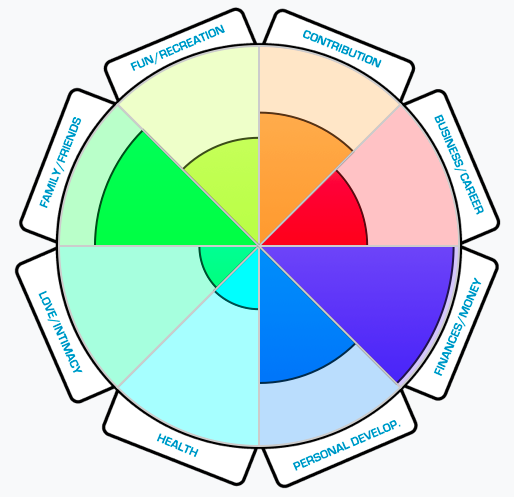 This Life Assessment will take about 3-4 minutes & cover the major areas of your life. When responding please consider your current experiences, feelings and beliefs. Upon completion you will receive a personalized assessment of your life. Based on your results you may choose to focus on a specific area of life when answering your daily questions. Sign up for a FREE 5 day TRIAL and discover the power of a question! Your new Mindset is just a click away! 0-19% Disconnection - At this stage people tend to lack a deeper connection with their true passion and desires. There is a tendency to live life on “auto-pilot” and simply go through the motions. 20-39% Contemplation - At this stage people are beginning to notice something is missing or out of alignment in their lives. This can sometimes show up as frustration, discomfort, or even illness. They may feel stuck or trapped. 40-59% Preparation - At this stage people are gathering and considering information that will support them in a desired outcome. They are making changes, but there is often a lack of consistent action. 60-79% Emerging - At this stage people tend to begin moving out of their comfort zones and take more consistent action. They are noticing the connection between their actions and the changes that are occurring in their lives. 80-100% Growing - During this stage people are inspired to continue growing, learning and gaining clarity about their responsibility in their own lives & the world.